A two-alarm fire damaged a Rochester, Mass. home Sunday morning. 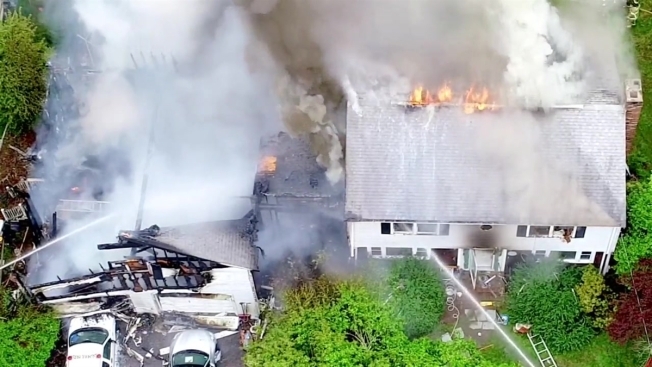 One person died in a two-alarm fire in a Rochester, Massachusetts home Sunday morning, according to the state fire marshal's office. The fire broke out at 1008 Walnut Plain Road around 9:30 a.m. and caused extensive damage to the home. Thick clouds of smoke were visible upon firefighters' arrival, and flames could be seen shooting out of the roof. There was no immediate word on what may have caused the fire, and the victim has not been identified. The fatal fire is under investigation.